Tea connoisseurs in Bengaluru, we found you a destination where you can indulge in the country’s finest blends & brews under one roof. Excited much? Check out Sancha Tea Boutique’s new outlet in Phoenix Market City, Whitefield for Matcha to Oolong and everything awesome. Delhi & Mumbai have been well acquainted with Sancha tea’s legacy and their excellent blends, whereas Bengaluru experienced its 1st Sancha 2.5 years ago at the Lavelle road and life’s been so much better ever since. 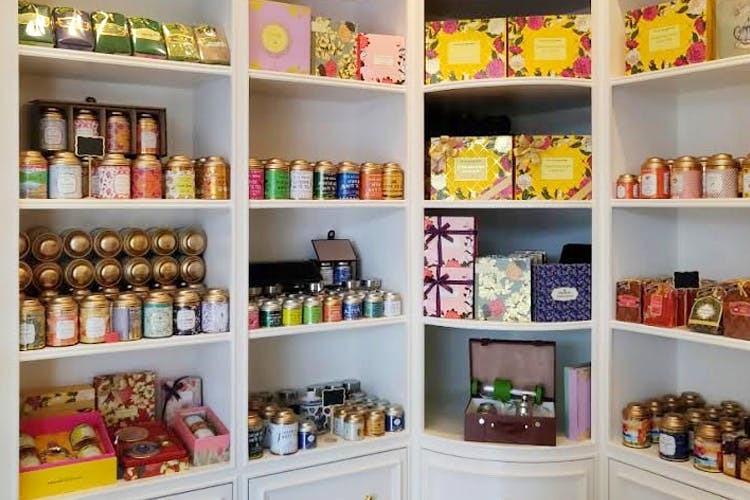 It’s time to welcome India’s oldest tea boutique in Whitefield now, and it’s all about pretty decor, functional tins and an expansive range of teas that you cannot miss. One thing you can be sure about is the top-notch quality of blends and the best tea leaves being used for your perfect cup of tea. They have 100 tea blends ( No, we’re not kidding) handpicked, and selected by India’s renowned master tea taster & blender, Mr. Sanjay Kapur. With over 40 years of experience, no one has ever left their outlet without falling in love with their teas. And you’ll get to witness the same at their new Phoenix Market City outlet too. They have a wide range of options to choose from such as the White, Green, Oolong, Black and Herbal Teas. If you don’t know your favourite yet, their trained staff will help you out. We loved the Matcha green & the Peppermint tea, helps us get through every day in absolute tranquility. What we also loved is their gorgeous tea equipment to brew the right cup of tea. You can grab yourself some tea infusers, fancy teapots with infusers, tea cups with infusers, tea cosies, tea tidys, floral English afternoon tea party trays, hand painted chai cups, kettles & overall good vibes. Head to their Phoenix Marketcity or Lavelle Road outlet to start shopping. Know more about the brand on their website. Follow them on Facebook & Instagram and stay updated new offers & launches.